Photo taken at Mesquite Wash, Mazatzal Mountains, Maricopa County, Arizona, August 25, 2008. It is taking nectar at flowers of Trailing Four O'Clock (Allionia incarnata). 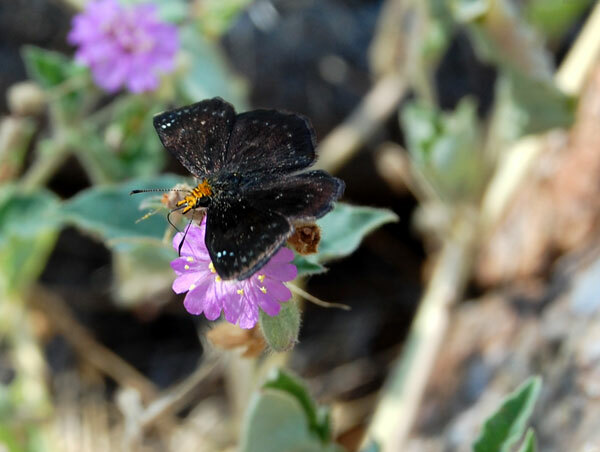 There are several species of mostly dark brown or black skipper butterflies in southern Arizona. This is the only common one with orange on the head and dorsal surface of the palps. It is one of the most common species in late spring and again after the summer monsoon rains in the Sonoran Desert occurring even in the hottest areas. It flies close to the ground and often visits damp soil and flowers. The host plant for the caterpillar have been recorded as various species of Chenopodium.